Clarksville, TN – Military conflicts are not fought in isolation, and the American Civil War was no different. While civilians like Serepta Jordan never lifted a musket, Jordan and millions like her felt its impact, and it is precisely that neglected perspective that made the discovery of her diary by area historians so significant. A working-class woman living in Clarksville during the war, Jordan was not a name remembered by history. 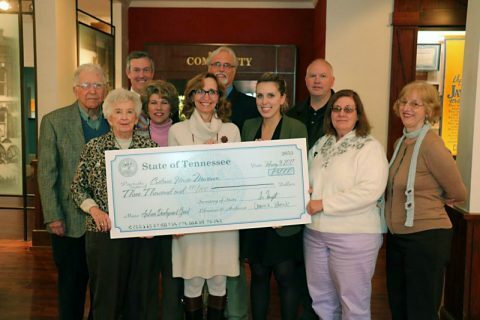 Minoa Uffelman holding the $3,000 Archive Development Grant check from the State of Tennessee. But although she never led soldiers into battle, she nonetheless faithfully recorded the war’s impact on the population of Clarksville in both major and minor ways through her daily writings from 1857 until 1864. Jordan’s writings are contained in a repurposed leather-bound ledger, but time has not been kind to her writings. Rediscovered in an outhouse in the 1980s and entrusted to the Customs House Museum shortly after, the fragile memoir was in desperate need of repair before Uffelman and a group of historians launched an effort to restore and publish Jordan’s detail of a pivotal time in American — and Clarksville — history. The restoration efforts recently received a major boost when Kali Mason, curator of collections at the Customs House Museum, obtained a $3,000 Archive Development Grant from the state of Tennessee. Delivered by Tennessee Secretary of State Tre Hargett, the grant will be used to continue the group’s preservation efforts. During a small event to celebrate the grant offering, Hargett, Clarksville Mayor Kim McMillan and Millie Armstrong, Jordan’s great-great-great-granddaughter, received an opportunity to observe the diary and discuss the work being done to preserve it for future generations. “The pages (of the diary) are filled with (Jordan’s) observations, feelings and experiences from the Civil War era in Clarksville,” Uffelman said. “Serepta describes military preparations as the community is raising units and women sew uniforms and other provisions for soldiers. As a working-class woman with no income or connections we gain insights into her struggles to survive as her one family member dies and leaves her alone in a world with no options for female careers. The diary project is the second for the team, who earlier edited a local work, “The Diary of Nannie Haskins Willians, A Southern Woman’s Story of Rebellion and Reconstruction, 1863-1890,” which was published in 2014 by the University of Tennessee Press. Upon completion of their transcription efforts, Uffelman said Jordan’s diary will also be published in a format that can be easily read and shared.